The Museum offers internship programs for high school, undergraduate, and graduate students throughout the year. Interns work onsite at the Museum, though some of our internship programs combine onsite work with programs in other educational settings. The High School Apprenticeship Program offers New York City public high school students a challenging program of study and work designed to give them a behind-the-scenes look at what it is like to work in the Museum and explore Jewish heritage and their own. After an extensive spring training, Apprentices work full-time during the summer in different Museum departments; lead tours, and are introduced to the curatorial, educational, administrative, and operational sides of the Museum. Apprentices are paid for their participation in the program. Students of all backgrounds are encouraged to apply. 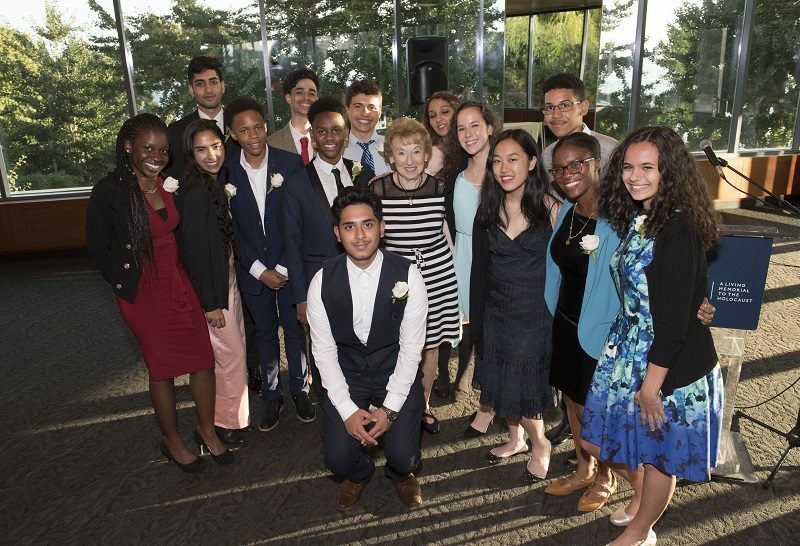 Applications for the 2019 High School Apprenticeship Program are online at mjhnyc.org/hsap2019 or a PDF/print version is here. Applications are due November 23. The above video was written, directed, and edited by members of the 2018 High School Apprenticeship Program. The Holocaust Educator Internship is a paid internship program at the Museum of Jewish Heritage – A Living Memorial to the Holocaust in New York City for undergraduate and graduate students currently studying in the New York metropolitan area. Interns are trained on how to teach the history of the Holocaust and then work with middle and high school students in public schools to understand this history. Interns receive in-depth training about the history of the Holocaust, teaching methodologies, and then teach students about the Holocaust so that the painful lessons of the past can guide them to envision a world worthy of their futures. In August, interns attend an intensive nine-day training at the Museum to learn how to teach public middle and high school students about the Holocaust. During training interns meet with Museum staff, hear testimony from Holocaust survivors, and learn methods for teaching from artifacts in the Museum’s collection. Following training, interns work in pairs, visiting several New York metropolitan-area middle and high schools to teach an introductory classroom lesson and then give tours to these classes at the Museum. Interns receive a stipend and are reimbursed for local travel. Interns may choose to work for school credit rather than pay. Currently enrolled undergraduate and graduate students of all backgrounds and academic interests are encouraged to apply. The Internship is designed for students from a variety of fields and backgrounds. The ideal candidate will have a desire to learn and educate, an appreciation for museums, and an ability to work well with others. No previous teaching or Holocaust study is required, although both of these are desirable. To apply, please complete the online form. Applications are due by April 30, 2019. For inquiries, please call 646.437.4273 or email Internships@mjhnyc.org. The Museum has general internships available to high school and university students that provide exposure to the programs and services provided by the Museum. Offered on a rolling basis according to departmental need, students can expect to volunteer in a broad range of capacities in support of the various functions of the Museum. To apply, please download the application online and return it by mail.